There is a wonderful tongue-in-cheek article in the Wall Street Journal today entitled "Weapons of Mass Construction" by Joe Queenan. In it he writes that a "McMansion the size of the Louvre is going up directly across the street from my house. Nine other monstrosities are also being deployed in what was a beautiful, empty meadow." He wishes that the economy is not dependent on the health of home builders. "... they are bulldozing whatever stands in their way and throwing up their eyesores. Throwing up being the operative term." It really is a great article, and perfectly describes what we are facing in Sierra Madre. Everyone knows that the health of the American economy depends a lot on housing starts. If the home-building industry is not doing well, the economy is failing. Life in these United States is a zero-sum game. We are all in this thing together. I hate being all in this thing together. Or let's just say, I hate being all in this thing together with the home-construction industry. Right now, a McMansion the size of the Louvre is going up directly across the street from my house. Nine other monstrosities are also being deployed in what was once a beautiful, empty meadow. The field has been filled with backhoes and earth movers and building materials on and off for at least two years. The projects, once begun, take forever to finish. The crew starts work on a house, then gets dispatched to finish another project in a different town, and then comes back. So it takes months to get the micro-chateaux built. It's like watching someone set fire to your neighborhood, then douse it, then come back and start the fire again six weeks later. You'd rather they just ruined things once and for all and got it over with. If you're going to sack Rome, sack it. Drilling, digging, dust and leveled trees have been our reality since 2011. It makes it very, very hard to root for the home builders. I am constantly reading that young people are not buying houses at the pace needed to get the economy percolating. Well, maybe someone should tell the developers to stop building lurid, vile houses that no one can afford. Or to stop building lurid, vile, prefab, ticky-tacky houses even if people can afford them. 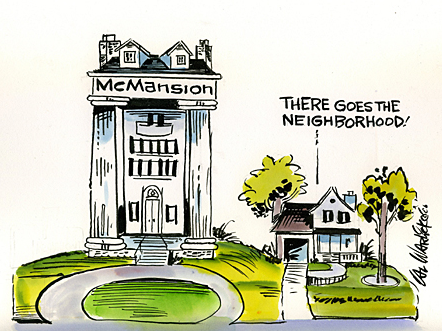 When the economy cratered in 2008 and my 401(k) got massacred, I wasn't as upset as I should have been because it meant that the McMansions scheduled to be erected across the street wouldn't get built until the recession was over. Four happy years ensued, without bogus cathedral windows and four-car garages and faux-Belgian cobblestones and Philistines for neighbors. This situation put me in the uncomfortable position of having to root against my own country. As long as the housing industry was flat on its back, life was good. I really wish that the economy were not so dependent upon the health of home builders. I would love to root for these guys. I really would. But they build trash. They tear down adorable bungalows and build McMansions in Princeton, N.J. In Chicago, in Boston, in Los Angeles and even in little old Easton, Pa., they are bulldozing whatever stands in their way and throwing up their eyesores. Throwing up being the operative term. Unlike the car guys, who build products that give me pleasure, or the pizzeria makers, who bake tasty pizza, or the clothing industry, which makes snappy shirts, fantastic trousers, fabulous anoraks and some pretty nifty chapeaus, the housing industry builds malignant, socially corrosive, architecturally putrescent stuff that I hate. The house-building folks fall into the same category as the leaf-blower, the weed-whacker and post-office guys. Ugh. I noticed that two of those developers were sponsors of the 4th of July parade, Mursol and Kensington. They have memorized the BIA and Realtors handbook on defeating those pesky citizens who want to preserve their town. Who voted for the Kensington again? I can't seem to find anyone who will admit to it. If you can't take it with you, you might as well just give it to Billy Shields. If the 4th of July parade had as its sponsors Mursol and Kensington, then why did it come in financially in the red? Sponsors should have picked up all of the costs not covered by fees and donations, doncha think? Good point. Who is going to pick up that balance? I didn't know it was in the red. What's the bad new$? How much in the red? The City was going to charge entrants for the parade so the Committee went out and got a sponsor to cover that part of the costs, thus Kensington. There are plenty of other costs that go into the 4th events and even though the costs are kept down, it's still going to have to be covered somehow. The figures are not in for this year. The Committee raises plenty of money to cover the cost of the parade. It is unnecessary City STAFF time that is the problem. Staff attends all of the meetings although there is a liaison at the meeting. Staff charges the Committee to be a this meeting. After the event, the City bills the event for staff time. City Hall is like an invasive plant that crowds out everything else. Its roots are everywhere. I saw far left wing liberal politicians slithering down the parade route. Neither Liu or Holden were there. Guess they don't need our votes right now. Tusayan developer Tom De Paolo and partners in Stilo Development Group, backed by *Italian investors*, have been trying to build at the Grand Canyon since 1991, when they began systematically acquiring private land within nearby Kaibab National Forest to site the development. The town has the right to take water from the plateau's aquifer, and their wells have caused water sources in the park to decline 10% in recent years. Park officials strongly oppose any new wells. What ? Sponsors don't need to pick up the tab! Organizers NEED to live within budget. It is happening everywhere. We must stop this madness in Sierra Madre. Sierra Madre is rapidly gentrifying. And the city likes that. They want the cash. Residents who have been here for a while get in the way of their operation. community than those who show up at the eleventh hour." So they do what you should be doing, good for them, they are at least involved Captain Obvious, what a dope. 4:57 - I am pretty sure that is the same argument tapeworms make. Just wait until this starts happening (but then again maybe it won't given California proclivities for population influx and reflux): new senior appartments are being built in Prince Edward Island town of Summerside and seniors are happily downsizing to these lovely little convenient units. What is left is 400 homes without buyers. The buyers are out west taking jobs in the oil extraction industry. Can you imagine the building boom in Alberta? What a frigging mess! You can ask every member of the family to pick his or her own chair to add to the room, so the room consist of a part of each one of you. If you're aiming to attain this particular appearance, place comfort on top of your list when you are choosing home furniture. So choosing the right furniture for your home or office can sometimes be a difficult task. We generally sit on the floor.